Hemoglobin (/ˈhiːməˌɡloʊbᵻn, ˈhɛ-, -moʊ-/); also spelled haemoglobin (United Kingdom spelling) and abbreviated Hb or Hgb, is the iron-containing oxygen-transport metalloprotein in the red blood cells of all vertebrates (with the exception of the fish family Channichthyidae) as well as the tissues of some invertebrates. Hemoglobin in the blood carries oxygen from the respiratory organs (lungs or gills) to the rest of the body (i.e. the tissues). There it releases the oxygen to permit aerobic respiration to provide energy to power the functions of the organism in the process called metabolism. In mammals, the protein makes up about 96% of the red blood cells' dry content (by weight), and around 35% of the total content (including water). Hemoglobin has an oxygen-binding capacity of 1.34 mL O2 per gram, which increases the total blood oxygen capacity seventy-fold compared to dissolved oxygen in blood. The mammalian hemoglobin molecule can bind (carry) up to four oxygen molecules. Hemoglobin is involved in the transport of other gases: It carries some of the body's respiratory carbon dioxide (about 20–25% of the total) as carbaminohemoglobin, in which CO2 is bound to the globin protein. The molecule also carries the important regulatory molecule nitric oxide bound to a globin protein thiol group, releasing it at the same time as oxygen. Hemoglobin is also found outside red blood cells and their progenitor lines. Other cells that contain hemoglobin include the A9 dopaminergic neurons in the substantia nigra, macrophages, alveolar cells, and mesangial cells in the kidney. In these tissues, hemoglobin has a non-oxygen-carrying function as an antioxidant and a regulator of iron metabolism. Hemoglobin and hemoglobin-like molecules are also found in many invertebrates, fungi, and plants. In these organisms, hemoglobins may carry oxygen, or they may act to transport and regulate other small molecules and ions such as carbon dioxide, nitric oxide, hydrogen sulfide and sulfide. A variant of the molecule, called leghemoglobin, is used to scavenge oxygen away from anaerobic systems, such as the nitrogen-fixing nodules of leguminous plants, before the oxygen can poison (deactivate) the system. In 1825 J.F. Engelhard discovered that the ratio of Fe to protein is identical in the hemoglobins of several species. From the known atomic mass of iron he calculated the molecular mass of hemoglobin to n × 16000 (n = number of iron atoms per hemoglobin, now known to be 4), the first determination of a protein's molecular mass. This "hasty conclusion" drew a lot of ridicule at the time from scientists who could not believe that any molecule could be that big. Gilbert Smithson Adair confirmed Engelhard's results in 1925 by measuring the osmotic pressure of hemoglobin solutions. The oxygen-carrying protein hemoglobin was discovered by Hünefeld in 1840. In 1851, German physiologist Otto Funke published a series of articles in which he described growing hemoglobin crystals by successively diluting red blood cells with a solvent such as pure water, alcohol or ether, followed by slow evaporation of the solvent from the resulting protein solution. Hemoglobin's reversible oxygenation was described a few years later by Felix Hoppe-Seyler. 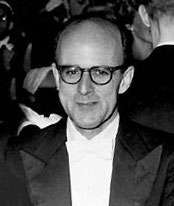 In 1959, Max Perutz determined the molecular structure of myoglobin (similar to hemoglobin) by X-ray crystallography. This work resulted in his sharing with John Kendrew the 1962 Nobel Prize in Chemistry. The role of hemoglobin in the blood was elucidated by French physiologist Claude Bernard. The name hemoglobin is derived from the words heme and globin, reflecting the fact that each subunit of hemoglobin is a globular protein with an embedded heme group. Each heme group contains one iron atom, that can bind one oxygen molecule through ion-induced dipole forces. The most common type of hemoglobin in mammals contains four such subunits. Hemoglobin consists of protein subunits (the "globin" molecules), and these proteins, in turn, are folded chains of a large number of different amino acids called polypeptides. The amino acid sequence of any polypeptide created by a cell is in turn determined by the stretches of DNA called genes. In all proteins, it is the amino acid sequence that determines the protein's chemical properties and function. There is more than one hemoglobin gene: in humans, hemoglobin A (the main form of hemoglobin present) is coded for by the genes, HBA1, HBA2, and HBB. The amino acid sequences of the globin proteins in hemoglobins usually differ between species. These differences grow with evolutionary distance between species. For example, the most common hemoglobin sequences in humans and chimpanzees are nearly identical, differing by only one amino acid in both the alpha and the beta globin protein chains. These differences grow larger between less closely related species. Even within a species, different variants of hemoglobin always exist, although one sequence is usually a "most common" one in each species. Mutations in the genes for the hemoglobin protein in a species result in hemoglobin variants. Many of these mutant forms of hemoglobin cause no disease. Some of these mutant forms of hemoglobin, however, cause a group of hereditary diseases termed the hemoglobinopathies. The best known hemoglobinopathy is sickle-cell disease, which was the first human disease whose mechanism was understood at the molecular level. A (mostly) separate set of diseases called thalassemias involves underproduction of normal and sometimes abnormal hemoglobins, through problems and mutations in globin gene regulation. All these diseases produce anemia. Protein alignment of human hemoglobin proteins, alpha, beta, and delta subunits respectively. The alignments were created using Uniprot's alignment tool available online. Variations in hemoglobin amino acid sequences, as with other proteins, may be adaptive. For example, hemoglobin has been found to adapt in different ways to high altitudes. Organisms living at high elevations experience lower partial pressures of oxygen compared to those at sea level. This presents a challenge to the organisms that inhabit such environments because hemoglobin, which normally binds oxygen at high partial pressures of oxygen, must be able to bind oxygen when it is present at a lower pressure. Different organisms have adapted to such a challenge. For example, recent studies have suggested genetic variants in deer mice that help explain how deer mice that live in the mountains are able to survive in the thin air that accompanies high altitudes. A researcher from the University of Nebraska-Lincoln found mutations in four different genes that can account for differences between deer mice that live in lowland prairies versus the mountains. After examining wild mice captured from both highlands and lowlands, it was found that: the genes of the two breeds are "virtually identical–except for those that govern the oxygen-carrying capacity of their hemoglobin". "The genetic difference enables highland mice to make more efficient use of their oxygen", since less is available at higher altitudes, such as those in the mountains. Mammoth hemoglobin featured mutations that allowed for oxygen delivery at lower temperatures, thus enabling mammoths to migrate to higher latitudes during the Pleistocene. This was also found in hummingbirds that inhabit the Andes. Hummingbirds already expend a lot of energy and thus have high oxygen demands and yet Andean hummingbirds have been found to thrive in high altitudes. Non-synonymous mutations in the hemoglobin gene of multiple species living at high elevations (Oreotrochilus, A. castelnaudii, C. violifer, P. gigas, and A. viridicuada) have caused the protein to have less of an affinity for inositol hexaphosphate (IHP), a molecule found in birds that has a similar role as 2,3-BPG in humans; this results in the ability to bind oxygen in lower partial pressures. It should be noted, however, that birds' unique circulatory lungs also promote efficient use of oxygen at low partial pressures of O2. These two adaptations reinforce each other and account for birds' remarkable high-altitude performance. Hemoglobin adaptation extends to humans, as well. Studies have found that a small number of native Tibetan women have a genotype which codes for hemoglobin to be more highly saturated with oxygen. Natural selection seems to be the main force working on this gene because mortality rate of offspring is significantly lower for women with higher hemoglobin-oxygen affinity when compared to the mortality rate of offspring from women with low hemoglobin-oxygen affinity. While the exact genotype and mechanism by which this occurs is not yet clear, selection is acting on these women's ability to bind oxygen in low partial pressures which overall allows them to better sustain crucial metabolic processes. Hemoglobin (Hb) is synthesized in a complex series of steps. The heme part is synthesized in a series of steps in the mitochondria and the cytosol of immature red blood cells, while the globin protein parts are synthesized by ribosomes in the cytosol. Production of Hb continues in the cell throughout its early development from the proerythroblast to the reticulocyte in the bone marrow. At this point, the nucleus is lost in mammalian red blood cells, but not in birds and many other species. Even after the loss of the nucleus in mammals, residual ribosomal RNA allows further synthesis of Hb until the reticulocyte loses its RNA soon after entering the vasculature (this hemoglobin-synthetic RNA in fact gives the reticulocyte its reticulated appearance and name). Hemoglobin has a quaternary structure characteristic of many multi-subunit globular proteins. Most of the amino acids in hemoglobin form alpha helices, connected by short non-helical segments. Hydrogen bonds stabilize the helical sections inside this protein, causing attractions within the molecule, folding each polypeptide chain into a specific shape. Hemoglobin's quaternary structure comes from its four subunits in roughly a tetrahedral arrangement. In most vertebrates, the hemoglobin molecule is an assembly of four globular protein subunits. Each subunit is composed of a protein chain tightly associated with a non-protein prosthetic heme group. Each protein chain arranges into a set of alpha-helix structural segments connected together in a globin fold arrangement, so called because this arrangement is the same folding motif used in other heme/globin proteins such as myoglobin. This folding pattern contains a pocket that strongly binds the heme group. A heme group consists of an iron (Fe) ion (charged atom) held in a heterocyclic ring, known as a porphyrin. This porphyrin ring consists of four pyrrole molecules cyclically linked together (by methine bridges) with the iron ion bound in the center. The iron ion, which is the site of oxygen binding, coordinates with the four nitrogen atoms in the center of the ring, which all lie in one plane. The iron is bound strongly (covalently) to the globular protein via the N atoms of the imidazole ring of F8 histidine residue (also known as the proximal histidine) below the porphyrin ring. A sixth position can reversibly bind oxygen by a coordinate covalent bond, completing the octahedral group of six ligands. Oxygen binds in an "end-on bent" geometry where one oxygen atom binds to Fe and the other protrudes at an angle. When oxygen is not bound, a very weakly bonded water molecule fills the site, forming a distorted octahedron. Even though carbon dioxide is carried by hemoglobin, it does not compete with oxygen for the iron-binding positions but is bound to the protein chains of the structure. The iron ion may be either in the Fe2+ or in the Fe3+ state, but ferrihemoglobin (methemoglobin) (Fe3+) cannot bind oxygen. In binding, oxygen temporarily and reversibly oxidizes (Fe2+) to (Fe3+) while oxygen temporarily turns into the superoxide ion, thus iron must exist in the +2 oxidation state to bind oxygen. If superoxide ion associated to Fe3+ is protonated, the hemoglobin iron will remain oxidized and incapable of binding oxygen. In such cases, the enzyme methemoglobin reductase will be able to eventually reactivate methemoglobin by reducing the iron center. In adult humans, the most common hemoglobin type is a tetramer (which contains four subunit proteins) called hemoglobin A, consisting of two α and two β subunits non-covalently bound, each made of 141 and 146 amino acid residues, respectively. This is denoted as α2β2. The subunits are structurally similar and about the same size. Each subunit has a molecular weight of about 16,000 daltons, for a total molecular weight of the tetramer of about 64,000 daltons (64,458 g/mol). Thus, 1 g/dL = 0.1551 mmol/L. Hemoglobin A is the most intensively studied of the hemoglobin molecules. In human infants, the hemoglobin molecule is made up of 2 α chains and 2 γ chains. The gamma chains are gradually replaced by β chains as the infant grows. The four polypeptide chains are bound to each other by salt bridges, hydrogen bonds, and the hydrophobic effect. In general, hemoglobin can be saturated with oxygen molecules (oxyhemoglobin), or desaturated with oxygen molecules (deoxyhemoglobin). Oxyhemoglobin is formed during physiological respiration when oxygen binds to the heme component of the protein hemoglobin in red blood cells. This process occurs in the pulmonary capillaries adjacent to the alveoli of the lungs. The oxygen then travels through the blood stream to be dropped off at cells where it is utilized as a terminal electron acceptor in the production of ATP by the process of oxidative phosphorylation. It does not, however, help to counteract a decrease in blood pH. Ventilation, or breathing, may reverse this condition by removal of carbon dioxide, thus causing a shift up in pH. Hemoglobin exists in two forms, a taut (tense) form (T) and a relaxed form (R). Various factors such as low pH, high CO2 and high 2,3 BPG at the level of the tissues favor the taut form, which has low oxygen affinity and releases oxygen in the tissues. Conversely, a high pH, low CO2, or low 2,3 BPG favors the relaxed form, which can better bind oxygen. The partial pressure of the system also affects O2 affinity where, at high partial pressures of oxygen (such as those present in the alveoli), the relaxed (high affinity, R) state is favoured. Inversely, at low partial pressures (such as those present in respiring tissues), the (low affinity, T) tense state is favoured. Additionally, the binding of oxygen to the iron(II) heme pulls the iron into the plane of the porphyrin ring, causing a slight conformational shift. The shift encourages oxygen to bind to the three remaining heme units within hemoglobin (thus, oxygen binding is cooperative). Deoxygenated hemoglobin is the form of hemoglobin without the bound oxygen. The absorption spectra of oxyhemoglobin and deoxyhemoglobin differ. The oxyhemoglobin has significantly lower absorption of the 660 nm wavelength than deoxyhemoglobin, while at 940 nm its absorption is slightly higher. This difference is used for the measurement of the amount of oxygen in a patient's blood by an instrument called a pulse oximeter. This difference also accounts for the presentation of cyanosis, the blue to purplish color that tissues develop during hypoxia. Scientists agree that the event that separated myoglobin from hemoglobin occurred after lampreys diverged from jawed vertebrates. This separation of myoglobin and hemoglobin allowed for the different functions of the two molecules to arise and develop: myoglobin has more to do with oxygen storage while hemoglobin is tasked with oxygen transport. The α- and β-like globin genes encode the individual subunits of the protein. The predecessors of these genes arose through another duplication event also after the gnathosome common ancestor derived from jawless fish, approximately 450–500 million years ago. The development of α and β genes created the potential for hemoglobin to be composed of multiple subunits, a physical composition central to hemoglobin's ability to transport oxygen. Having multiple subunits contributes to hemoglobin's ability to bind oxygen cooperatively as well as be regulated allosterically. Subsequently, the α gene also underwent a duplication event to form the HBA1 and HBA2 genes. These further duplications and divergences have created a diverse range of α- and β-like globin genes that are regulated so that certain forms occur at different stages of development. Triplet oxygen, the lowest-energy molecular oxygen species, has two unpaired electrons in antibonding π* molecular orbitals. Iron(II) tends to exist in a high-spin 3d6 configuration with four unpaired electrons. Iron(III) (3d5) has an odd number of electrons, and thus must have one or more unpaired electrons, in any energy state. All of these structures are paramagnetic (have unpaired electrons), not diamagnetic. Thus, a non-intuitive (e.g., a higher-energy for at least one species) distribution of electrons in the combination of iron and oxygen must exist, in order to explain the observed diamagnetism and no unpaired electrons. Low-spin Fe2+ binds to singlet oxygen. Both low-spin iron and singlet oxygen are diamagnetic. However, the singlet form of oxygen is the higher-energy form of the molecule. Low-spin Fe3+ binds to O2•− (the superoxide ion) and the two unpaired electrons couple antiferromagnetically, giving observed diamagnetic properties. Here, the iron has been oxidized (has lost one electron), and the oxygen has been reduced (has gained one electron). Another possible model in which low-spin Fe4+ binds to peroxide, O22−, can be ruled out by itself, because the iron is paramagnetic (although the peroxide ion is diamagnetic). Here, the iron has been oxidized by two electrons, and the oxygen reduced by two electrons. Infrared vibrational frequencies of the O-O bond suggests a bond length fitting with superoxide (a bond order of about 1.6, with superoxide being 1.5). X-ray Absorption Near Edge Structures at the iron K-edge. The energy shift of 5 eV between deoxyhemoglobin and oxyhemoglobin, as for all the methemoglobin species, strongly suggests an actual local charge closer to Fe3+ than Fe2+. Thus, the nearest formal oxidation state of iron in Hb-O2 is the +3 state, with oxygen in the −1 state (as superoxide .O2−). The diamagnetism in this configuration arises from the single unpaired electron on superoxide aligning antiferromagnetically with the single unpaired electron on iron (in a low-spin d5 state), to give no net spin to the entire configuration, in accordance with diamagnetic oxyhemoglobin from experiment. The second choice of the logical possibilities above for diamagnetic oxyhemoglobin being found correct by experiment, is not surprising: singlet oxygen (possibility #1) is an unrealistically high energy state. Model 3 leads to unfavorable separation of charge (and does not agree with the magnetic data), although it could make a minor contribution as a resonance form. Iron's shift to a higher oxidation state in Hb-O2 decreases the atom's size, and allows it into the plane of the porphyrin ring, pulling on the coordinated histidine residue and initiating the allosteric changes seen in the globulins. Early postulates by bio-inorganic chemists claimed that possibility #1 (above) was correct and that iron should exist in oxidation state II. This conclusion seemed likely, since the iron oxidation state III as methemoglobin, when not accompanied by superoxide .O2− to "hold" the oxidation electron, was known to render hemoglobin incapable of binding normal triplet O2 as it occurs in the air. It was thus assumed that iron remained as Fe(II) when oxygen gas was bound in the lungs. The iron chemistry in this previous classical model was elegant, but the required presence of the diamagnetic, high-energy, singlet oxygen molecule was never explained. It was classically argued that the binding of an oxygen molecule placed high-spin iron(II) in an octahedral field of strong-field ligands; this change in field would increase the crystal field splitting energy, causing iron's electrons to pair into the low-spin configuration, which would be diamagnetic in Fe(II). This forced low-spin pairing is indeed thought to happen in iron when oxygen binds, but is not enough to explain iron's change in size. Extraction of an additional electron from iron by oxygen is required to explain both iron's smaller size and observed increased oxidation state, and oxygen's weaker bond. The assignment of a whole-number oxidation state is a formalism, as the covalent bonds are not required to have perfect bond orders involving whole electron transfer. Thus, all three models for paramagnetic Hb-O2 may contribute to some small degree (by resonance) to the actual electronic configuration of Hb-O2. However, the model of iron in Hb-O2 being Fe(III) is more correct than the classical idea that it remains Fe(II). When oxygen binds to the iron complex, it causes the iron atom to move back toward the center of the plane of the porphyrin ring (see moving diagram). At the same time, the imidazole side-chain of the histidine residue interacting at the other pole of the iron is pulled toward the porphyrin ring. This interaction forces the plane of the ring sideways toward the outside of the tetramer, and also induces a strain in the protein helix containing the histidine as it moves nearer to the iron atom. This strain is transmitted to the remaining three monomers in the tetramer, where it induces a similar conformational change in the other heme sites such that binding of oxygen to these sites becomes easier. In the tetrameric form of normal adult hemoglobin, the binding of oxygen is, thus, a cooperative process. The binding affinity of hemoglobin for oxygen is increased by the oxygen saturation of the molecule, with the first oxygens bound influencing the shape of the binding sites for the next oxygens, in a way favorable for binding. This positive cooperative binding is achieved through steric conformational changes of the hemoglobin protein complex as discussed above; i.e., when one subunit protein in hemoglobin becomes oxygenated, a conformational or structural change in the whole complex is initiated, causing the other subunits to gain an increased affinity for oxygen. As a consequence, the oxygen binding curve of hemoglobin is sigmoidal, or S-shaped, as opposed to the normal hyperbolic curve associated with noncooperative binding. The dynamic mechanism of the cooperativity in hemoglobin and its relation with the low-frequency resonance has been discussed. Besides the oxygen ligand, which binds to hemoglobin in a cooperative manner, hemoglobin ligands also include competitive inhibitors such as carbon monoxide (CO) and allosteric ligands such as carbon dioxide (CO2) and nitric oxide (NO). The carbon dioxide is bound to amino groups of the globin proteins as carbaminohemoglobin, and is thought to account for about 10% of carbon dioxide transport in mammals. Nitric oxide is bound to specific thiol groups in the globin protein to form an S-nitrosothiol, which dissociates into free nitric oxide and thiol again, as the hemoglobin releases oxygen from its heme site. This nitric oxide transport to peripheral tissues is hypothesized to assist oxygen transport in tissues, by releasing vasodilatory nitric oxide to tissues in which oxygen levels are low. The binding of oxygen is affected by molecules such as carbon monoxide (CO) (for example, from tobacco smoking, car exhaust, and incomplete combustion in furnaces). CO competes with oxygen at the heme binding site. Hemoglobin binding affinity for CO is 250 times greater than its affinity for oxygen, meaning that small amounts of CO dramatically reduce hemoglobin's ability to transport oxygen. Since carbon monoxide is a colorless, odorless and tasteless gas, and poses a potentially fatal threat, detectors have become commercially available to warn of dangerous levels in residences. When hemoglobin combines with CO, it forms a very bright red compound called carboxyhemoglobin, which may cause the skin of CO poisoning victims to appear pink in death, instead of white or blue. When inspired air contains CO levels as low as 0.02%, headache and nausea occur; if the CO concentration is increased to 0.1%, unconsciousness will follow. In heavy smokers, up to 20% of the oxygen-active sites can be blocked by CO. In similar fashion, hemoglobin also has competitive binding affinity for cyanide (CN−), sulfur monoxide (SO), and sulfide (S2−), including hydrogen sulfide (H2S). All of these bind to iron in heme without changing its oxidation state, but they nevertheless inhibit oxygen-binding, causing grave toxicity. The iron atom in the heme group must initially be in the ferrous (Fe2+) oxidation state to support oxygen and other gases' binding and transport (it temporarily switches to ferric during the time oxygen is bound, as explained above). Initial oxidation to the ferric (Fe3+) state without oxygen converts hemoglobin into "hemiglobin" or methemoglobin (pronounced "MET-hemoglobin"), which cannot bind oxygen. Hemoglobin in normal red blood cells is protected by a reduction system to keep this from happening. Nitric oxide is capable of converting a small fraction of hemoglobin to methemoglobin in red blood cells. The latter reaction is a remnant activity of the more ancient nitric oxide dioxygenase function of globins. The sigmoidal shape of hemoglobin's oxygen-dissociation curve results from cooperative binding of oxygen to hemoglobin. Hence, blood with high carbon dioxide levels is also lower in pH (more acidic). Hemoglobin can bind protons and carbon dioxide, which causes a conformational change in the protein and facilitates the release of oxygen. Protons bind at various places on the protein, while carbon dioxide binds at the α-amino group. Carbon dioxide binds to hemoglobin and forms carbaminohemoglobin. This decrease in hemoglobin's affinity for oxygen by the binding of carbon dioxide and acid is known as the Bohr effect (shifts the O2-saturation curve to the right). Conversely, when the carbon dioxide levels in the blood decrease (i.e., in the lung capillaries), carbon dioxide and protons are released from hemoglobin, increasing the oxygen affinity of the protein. A reduction in the total binding capacity of hemoglobin to oxygen (i.e. shifting the curve down, not just to the right) due to reduced pH is called the root effect. This is seen in bony fish. It is necessary for hemoglobin to release the oxygen that it binds; if not, there is no point in binding it. The sigmoidal curve of hemoglobin makes it efficient in binding (taking up O2 in lungs), and efficient in unloading (unloading O2 in tissues). In people acclimated to high altitudes, the concentration of 2,3-Bisphosphoglycerate (2,3-BPG) in the blood is increased, which allows these individuals to deliver a larger amount of oxygen to tissues under conditions of lower oxygen tension. This phenomenon, where molecule Y affects the binding of molecule X to a transport molecule Z, is called a heterotropic allosteric effect. Hemoglobin in organisms at high altitudes has also adapted such that it has less of an affinity for 2,3-BPG and so the protein will be shifted more towards its R state. In its R state, hemoglobin will bind oxygen more readily, thus allowing organisms to perform the necessary metabolic processes when oxygen is present at low partial pressures. Animals other than humans use different molecules to bind to hemoglobin and change its O2 affinity under unfavorable conditions. Fish use both ATP and GTP. These bind to a phosphate "pocket" on the fish hemoglobin molecule, which stabilizes the tense state and therefore decreases oxygen affinity. GTP reduces hemoglobin oxygen affinity much more than ATP, which is thought to be due to an extra hydrogen bond formed that further stabilizes the tense state. Under hypoxic conditions, the concentration of both ATP and GTP is reduced in fish red blood cells to increase oxygen affinity. A variant hemoglobin, called fetal hemoglobin (HbF, α2γ2), is found in the developing fetus, and binds oxygen with greater affinity than adult hemoglobin. 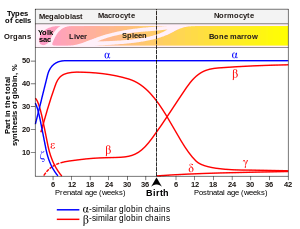 This means that the oxygen binding curve for fetal hemoglobin is left-shifted (i.e., a higher percentage of hemoglobin has oxygen bound to it at lower oxygen tension), in comparison to that of adult hemoglobin. As a result, fetal blood in the placenta is able to take oxygen from maternal blood. Hemoglobin also carries nitric oxide (NO) in the globin part of the molecule. This improves oxygen delivery in the periphery and contributes to the control of respiration. NO binds reversibly to a specific cysteine residue in globin; the binding depends on the state (R or T) of the hemoglobin. The resulting S-nitrosylated hemoglobin influences various NO-related activities such as the control of vascular resistance, blood pressure and respiration. NO is not released in the cytoplasm of erythrocytes but transported by an anion exchanger called AE1 out of them. Hemoglobin variants are a part of the normal embryonic and fetal development. They may also be pathologic mutant forms of hemoglobin in a population, caused by variations in genetics. Some well-known hemoglobin variants, such as sickle-cell anemia, are responsible for diseases and are considered hemoglobinopathies. Other variants cause no detectable pathology, and are thus considered non-pathological variants. Hemoglobin F (α2γ2) (PDB: 1FDH​). Hemoglobin F (α2γ2) – In adults Hemoglobin F is restricted to a limited population of red cells called F-cells. However, the level of Hb F can be elevated in persons with sickle-cell disease and beta-thalassemia. Hemoglobin D-Punjab – (α2βD2) – A variant form of hemoglobin. Hemoglobin H (β4) – A variant form of hemoglobin, formed by a tetramer of β chains, which may be present in variants of α thalassemia. Hemoglobin Barts (γ4) – A variant form of hemoglobin, formed by a tetramer of γ chains, which may be present in variants of α thalassemia. Hemoglobin S (α2βS2) – A variant form of hemoglobin found in people with sickle cell disease. There is a variation in the β-chain gene, causing a change in the properties of hemoglobin, which results in sickling of red blood cells. Hemoglobin C (α2βC2) – Another variant due to a variation in the β-chain gene. This variant causes a mild chronic hemolytic anemia. Hemoglobin E (α2βE2) – Another variant due to a variation in the β-chain gene. This variant causes a mild chronic hemolytic anemia. Hemoglobin SC disease – A compound heterozygous form with one sickle gene and another encoding Hemoglobin C.
When red cells reach the end of their life due to aging or defects, they are removed from the circulation by the phagocytic activity of macrophages in the spleen or the liver or hemolyze within the circulation. Free hemoglobin is then cleared from the circulation via the hemoglobin transporter CD163, which is exclusively expressed on monocytes or macrophages. Within these cells the hemoglobin molecule is broken up, and the iron gets recycled. This process also produces one molecule of carbon monoxide for every molecule of heme degraded. Heme degradation is one of the few natural sources of carbon monoxide in the human body, and is responsible for the normal blood levels of carbon monoxide even in people breathing pure air. The other major final product of heme degradation is bilirubin. Increased levels of this chemical are detected in the blood if red cells are being destroyed more rapidly than usual. Improperly degraded hemoglobin protein or hemoglobin that has been released from the blood cells too rapidly can clog small blood vessels, especially the delicate blood filtering vessels of the kidneys, causing kidney damage. Iron is removed from heme and salvaged for later use, it is stored as hemosiderin or ferritin in tissues and transported in plasma by beta globulins as transferrins. When the porphyrin ring is broken up, the fragments are normally secreted as a yellow pigment called bilirubin, which is secreted into the intestines as bile. Intestines metabolise bilirubin into urobilinogen. Urobilinogen leaves the body in faeces, in a pigment called stercobilin. Globulin is metabolised into amino acids that are then released into circulation. Hemoglobin deficiency can be caused either by a decreased amount of hemoglobin molecules, as in anemia, or by decreased ability of each molecule to bind oxygen at the same partial pressure of oxygen. Hemoglobinopathies (genetic defects resulting in abnormal structure of the hemoglobin molecule) may cause both. In any case, hemoglobin deficiency decreases blood oxygen-carrying capacity. Hemoglobin deficiency is, in general, strictly distinguished from hypoxemia, defined as decreased partial pressure of oxygen in blood, although both are causes of hypoxia (insufficient oxygen supply to tissues). Other common causes of low hemoglobin include loss of blood, nutritional deficiency, bone marrow problems, chemotherapy, kidney failure, or abnormal hemoglobin (such as that of sickle-cell disease). The ability of each hemoglobin molecule to carry oxygen is normally modified by altered blood pH or CO2, causing an altered oxygen–hemoglobin dissociation curve. However, it can also be pathologically altered in, e.g., carbon monoxide poisoning. Decrease of hemoglobin, with or without an absolute decrease of red blood cells, leads to symptoms of anemia. Anemia has many different causes, although iron deficiency and its resultant iron deficiency anemia are the most common causes in the Western world. As absence of iron decreases heme synthesis, red blood cells in iron deficiency anemia are hypochromic (lacking the red hemoglobin pigment) and microcytic (smaller than normal). Other anemias are rarer. In hemolysis (accelerated breakdown of red blood cells), associated jaundice is caused by the hemoglobin metabolite bilirubin, and the circulating hemoglobin can cause renal failure. Some mutations in the globin chain are associated with the hemoglobinopathies, such as sickle-cell disease and thalassemia. Other mutations, as discussed at the beginning of the article, are benign and are referred to merely as hemoglobin variants. There is a group of genetic disorders, known as the porphyrias that are characterized by errors in metabolic pathways of heme synthesis. King George III of the United Kingdom was probably the most famous porphyria sufferer. To a small extent, hemoglobin A slowly combines with glucose at the terminal valine (an alpha aminoacid) of each β chain. The resulting molecule is often referred to as Hb A1c. As the concentration of glucose in the blood increases, the percentage of Hb A that turns into Hb A1c increases. In diabetics whose glucose usually runs high, the percent Hb A1c also runs high. Because of the slow rate of Hb A combination with glucose, the Hb A1c percentage is representative of glucose level in the blood averaged over a longer time (the half-life of red blood cells, which is typically 50–55 days). Glycosylated hemoglobin is the form of hemoglobin to which glucose is bound. The binding of glucose to amino acids in the hemoglobin takes place spontaneously (without the help of an enzyme) in many proteins, and is not known to serve a useful purpose. However, the binding to hemoglobin does serve as a record for average blood glucose levels over the lifetime of red cells, which is approximately 120 days. The levels of glycosylated hemoglobin are therefore measured in order to monitor the long-term control of the chronic disease of type 2 diabetes mellitus (T2DM). Poor control of T2DM results in high levels of glycosylated hemoglobin in the red blood cells. The normal reference range is approximately 4–5.9 %. Though difficult to obtain, values less than 7% are recommended for people with T2DM. Levels greater than 9% are associated with poor control of the glycosylated hemoglobin, and levels greater than 12% are associated with very poor control. Diabetics who keep their glycosylated hemoglobin levels close to 7% have a much better chance of avoiding the complications that may accompany diabetes (than those whose levels are 8% or higher). In addition, increased glycosylation of hemoglobin increases its affinity for oxygen, therefore preventing its release at the tissue and inducing a level of hypoxia in extreme cases. Elevated levels of hemoglobin are associated with increased numbers or sizes of red blood cells, called polycythemia. This elevation may be caused by congenital heart disease, cor pulmonale, pulmonary fibrosis, too much erythropoietin, or polycythemia vera. High hemoglobin levels may also be caused by exposure to high altitudes, smoking, dehydration (artificially by concentrating Hb), advanced lung disease and certain tumors. A recent study done in Pondicherry, India, shows its importance in coronary artery disease. A hemoglobin concentration measurement being administered before a blood donation at the American Red Cross Boston Blood Donation Center. Normal values of hemoglobin in the 1st and 3rd trimesters of pregnant women must be at least 11 g/dL and at least 10.5 g/dL during the 2nd trimester. Dehydration or hyperhydration can greatly influence measured hemoglobin levels. Albumin can indicate hydration status. If the concentration is below normal, this is called anemia. Anemias are classified by the size of red blood cells, the cells that contain hemoglobin in vertebrates. The anemia is called "microcytic" if red cells are small, "macrocytic" if they are large, and "normocytic" otherwise. Hematocrit, the proportion of blood volume occupied by red blood cells, is typically about three times the hemoglobin concentration measured in g/dL. For example, if the hemoglobin is measured at 17 g/dL, that compares with a hematocrit of 51%. Laboratory hemoglobin test methods require a blood sample (arterial, venous, or capillary) and analysis on hematology analyzer and CO-oximeter. Additionally, a new noninvasive hemoglobin (SpHb) test method called Pulse CO-Oximetry is also available with comparable accuracy to invasive methods. Concentrations of oxy- and deoxyhemoglobin can be measured continuously, regionally and noninvasively using NIRS. NIRS can be used both on the head as on muscles. This technique is often used for research in e.g. elite sports training, ergonomics, rehabilitation, patient monitoring, neonatal research, functional brain monitoring, brain computer interface, urology (bladder contraction), neurology (Neurovascular coupling) and more. Long-term control of blood sugar concentration can be measured by the concentration of Hb A1c. Measuring it directly would require many samples because blood sugar levels vary widely through the day. Hb A1c is the product of the irreversible reaction of hemoglobin A with glucose. A higher glucose concentration results in more Hb A1c. Because the reaction is slow, the Hb A1c proportion represents glucose level in blood averaged over the half-life of red blood cells, is typically 50–55 days. An Hb A1c proportion of 6.0% or less show good long-term glucose control, while values above 7.0% are elevated. This test is especially useful for diabetics. The functional magnetic resonance imaging (fMRI) machine uses the signal from deoxyhemoglobin, which is sensitive to magnetic fields since it is paramagnetic. Combined measurement with NIRS shows good correlation with both the oxy- and deoxyhemoglobin signal compared to the BOLD signal. Hemoglobin can be tracked noninvasively, to build an individual data set tracking the hemoconcentration and hemodilution effects of daily activities for better understanding of sports performance and training. Athletes are often concerned about endurance and intensity of exercise. Using the scientific technique of absorption spectroscopy with eight wavelengths of light. This method is similar to a pulse oximeter, which consists of a small sensing device that clips to the finger. The sensor uses light-emitting diodes that emit red and infrared light through the tissue to a light detector, which then sends a signal to a processor to calculate the absorption of light by the hemoglobin protein. A variety of oxygen-transport and -binding proteins exist in organisms throughout the animal and plant kingdoms. Organisms including bacteria, protozoans, and fungi all have hemoglobin-like proteins whose known and predicted roles include the reversible binding of gaseous ligands. Since many of these proteins contain globins and the heme moiety (iron in a flat porphyrin support), they are often called hemoglobins, even if their overall tertiary structure is very different from that of vertebrate hemoglobin. In particular, the distinction of "myoglobin" and hemoglobin in lower animals is often impossible, because some of these organisms do not contain muscles. Or, they may have a recognizable separate circulatory system but not one that deals with oxygen transport (for example, many insects and other arthropods). In all these groups, heme/globin-containing molecules (even monomeric globin ones) that deal with gas-binding are referred to as oxyhemoglobins. In addition to dealing with transport and sensing of oxygen, they may also deal with NO, CO2, sulfide compounds, and even O2 scavenging in environments that must be anaerobic. They may even deal with detoxification of chlorinated materials in a way analogous to heme-containing P450 enzymes and peroxidases. The structure of hemoglobins varies across species. Hemoglobin occurs in all kingdoms of organisms, but not in all organisms. Primitive species such as bacteria, protozoa, algae, and plants often have single-globin hemoglobins. Many nematode worms, molluscs, and crustaceans contain very large multisubunit molecules, much larger than those in vertebrates. In particular, chimeric hemoglobins found in fungi and giant annelids may contain both globin and other types of proteins. One of the most striking occurrences and uses of hemoglobin in organisms is in the giant tube worm (Riftia pachyptila, also called Vestimentifera), which can reach 2.4 meters length and populates ocean volcanic vents. Instead of a digestive tract, these worms contain a population of bacteria constituting half the organism's weight. The bacteria react with H2S from the vent and O2 from the water to produce energy to make food from H2O and CO2. The worms end with a deep-red fan-like structure ("plume"), which extends into the water and absorbs H2S and O2 for the bacteria, and CO2 for use as synthetic raw material similar to photosynthetic plants. The structures are bright-red due to their containing several extraordinarily complex hemoglobins that have up to 144 globin chains, each including associated heme structures. These hemoglobins are remarkable for being able to carry oxygen in the presence of sulfide, and even to carry sulfide, without being completely "poisoned" or inhibited by it as hemoglobins in most other species are. Found in the muscle tissue of many vertebrates, including humans, it gives muscle tissue a distinct red or dark gray color. It is very similar to hemoglobin in structure and sequence, but is not a tetramer; instead, it is a monomer that lacks cooperative binding. It is used to store oxygen rather than transport it. The second most common oxygen-transporting protein found in nature, it is found in the blood of many arthropods and molluscs. Uses copper prosthetic groups instead of iron heme groups and is blue in color when oxygenated. Some marine invertebrates and a few species of annelid use this iron-containing non-heme protein to carry oxygen in their blood. Appears pink/violet when oxygenated, clear when not. Found in many annelids, it is very similar to erythrocruorin, but the heme group is significantly different in structure. Appears green when deoxygenated and red when oxygenated. Also known as vanadium chromagens, they are found in the blood of sea squirts. They were once hypothesized to use the rare metal vanadium as an oxygen binding prosthetic group. However, although they do contain vanadium by preference, they apparently bind little oxygen, and thus have some other function, which has not been elucidated (sea squirts also contain some hemoglobin). They may act as toxins. Found in many annelids, including earthworms, it is a giant free-floating blood protein containing many dozens—possibly hundreds—of iron- and heme-bearing protein subunits bound together into a single protein complex with a molecular mass greater than 3.5 million daltons. Only seen in the mollusc Pinna nobilis. Brown manganese-based porphyrin protein. In leguminous plants, such as alfalfa or soybeans, the nitrogen fixing bacteria in the roots are protected from oxygen by this iron heme containing oxygen-binding protein. The specific enzyme protected is nitrogenase, which is unable to reduce nitrogen gas in the presence of free oxygen. A synthetic cobalt-based porphyrin. Coboprotein would appear colorless when oxygenated, but yellow when in veins. Some nonerythroid cells (i.e., cells other than the red blood cell line) contain hemoglobin. In the brain, these include the A9 dopaminergic neurons in the substantia nigra, astrocytes in the cerebral cortex and hippocampus, and in all mature oligodendrocytes. It has been suggested that brain hemoglobin in these cells may enable the "storage of oxygen to provide a homeostatic mechanism in anoxic conditions, which is especially important for A9 DA neurons that have an elevated metabolism with a high requirement for energy production". It has been noted further that "A9 dopaminergic neurons may be at particular risk since in addition to their high mitochondrial activity they are under intense oxidative stress caused by the production of hydrogen peroxide via autoxidation and/or monoamine oxidase (MAO)-mediated deamination of dopamine and the subsequent reaction of accessible ferrous iron to generate highly toxic hydroxyl radicals". This may explain the risk of these cells for degeneration in Parkinson's disease. The hemoglobin-derived iron in these cells is not the cause of the post-mortem darkness of these cells (origin of the Latin name, substantia nigra), but rather is due to neuromelanin. Outside the brain, hemoglobin has non-oxygen-carrying functions as an antioxidant and a regulator of iron metabolism in macrophages, alveolar cells, and mesangial cells in the kidney. Heart of Steel (Hemoglobin) (2005) by Julian Voss-Andreae. The images show the 5-foot (1.60 m) tall sculpture right after installation, after 10 days, and after several months of exposure to the elements. Historically, an association between the color of blood and rust occurs in the association of the planet Mars, with the Roman god of war, since the planet is an orange-red, which reminded the ancients of blood. Although the color of the planet is due to iron compounds in combination with oxygen in the Martian soil, it is a common misconception that the iron in hemoglobin and its oxides gives blood its red color. The color is actually due to the porphyrin moiety of hemoglobin to which the iron is bound, not the iron itself, although the ligation and redox state of the iron can influence the pi to pi* or n to pi* electronic transitions of the porphyrin and hence its optical characteristics. Artist Julian Voss-Andreae created a sculpture called "Heart of Steel (Hemoglobin)" in 2005, based on the protein's backbone. The sculpture was made from glass and weathering steel. The intentional rusting of the initially shiny work of art mirrors hemoglobin's fundamental chemical reaction of oxygen binding to iron. Montreal artist Nicolas Baier created Lustre (Hémoglobine), a sculpture in stainless steel that shows the structure of the hemoglobin molecule. It is displayed in the atrium of McGill University Health Centre's research centre in Montreal. The sculpture measures about 10 metres × 10 metres × 10 metres. Vaska's complex – iridium organometallic complex notable for its ability to bind to O2 reversibly. ↑ "Hemoglobin". Dictionary.com Unabridged. Random House. ↑ Maton, Anthea; Jean Hopkins; Charles William McLaughlin; Susan Johnson; Maryanna Quon Warner; David LaHart; Jill D. Wright (1993). Human Biology and Health. Englewood Cliffs, New Jersey, USA: Prentice Hall. ISBN 0-13-981176-1. ↑ Sidell, Bruce; Kristin O'Brien (2006). "When bad things happen to good fish: the loss of hemoglobin and myoglobin expression in Antarctic icefishes". The Journal of Experimental Biology. 209 (Pt 10): 1791–1802. doi:10.1242/jeb.02091. PMID 16651546. ↑ Weed, Robert I.; Reed, Claude F.; Berg, George (1963). "Is hemoglobin an essential structural component of human erythrocyte membranes?". J Clin Invest. 42 (4): 581–8. doi:10.1172/JCI104747. PMC 289318 . PMID 13999462. ↑ Dominguez de Villota ED, Ruiz Carmona MT, Rubio JJ, de Andrés S (1981). "Equality of the in vivo and in vitro oxygen-binding capacity of haemoglobin in patients with severe respiratory disease". Br J Anaesth. 53 (12): 1325–8. doi:10.1093/bja/53.12.1325. PMID 7317251. ↑ Costanzo, Linda S. (2007). Physiology. Hagerstwon, MD: Lippincott Williams & Wilkins. ISBN 0-7817-7311-3. ↑ Patton, Kevin T. (2015-02-10). Anatomy and Physiology. Elsevier Health Sciences. ISBN 9780323316873. ↑ Epstein, F. H.; Hsia, C. C. W. (1998). "Respiratory Function of Hemoglobin". New England Journal of Medicine. 338 (4): 239–247. doi:10.1056/NEJM199801223380407. PMID 9435331. 1 2 3 4 5 Biagioli M, Pinto M, Cesselli D, et al. (2009). "Unexpected expression of alpha- and beta-globin in mesencephalic dopaminergic neurons and glial cells". Proc. Natl. Acad. Sci. U.S.A. 106 (36): 15454–9. doi:10.1073/pnas.0813216106. PMC 2732704 . PMID 19717439. 1 2 Weber RE, Vinogradov SN (2001). "Nonvertebrate hemoglobins: functions and molecular adaptations". Physiol. Rev. 81 (2): 569–628. PMID 11274340. ↑ Engelhard, Johann Friedrich (1825). Commentatio de vera materia sanguini purpureum colorem impertientis natura (in Latin). Göttingen: Dietrich. ↑ Adair, Gilbert Smithson (1925). "A critical study of the direct method of measuring the osmotic pressure of hǣmoglobin". Proc. R. Soc. Lond. A 108 (750): 292–300. doi:10.1098/rspa.1925.0126. ↑ Hünefeld F.L. (1840). "Die Chemismus in der thierischen Organization". Leipzig. ↑ Funke O (1851). "Über das milzvenenblut". Z Rat Med. 1: 172–218. ↑ "A NASA Recipe For Protein Crystallography" (PDF). Educational Brief. National Aeronautics and Space Administration. Archived from the original (PDF) on 2008-04-10. Retrieved 2008-10-12. ↑ Hoppe-Seyler F (1866). "Über die oxydation in lebendem blute". Med-chem Untersuch Lab. 1: 133–140. ↑ Perutz, M.F. ; Rossmann, M.G. ; Cullis, A.F. ; Muirhead, H.; Will, G.; North, A.C.T. (1960). "Structure of H". Nature. 185 (4711): 416–422. doi:10.1038/185416a0. PMID 18990801. ↑ Perutz MF (1960). "Structure of haemoglobin". Brookhaven symposia in biology. 13: 165–83. PMID 13734651. 1 2 Hardison, Ross C. (2012-12-01). "Evolution of hemoglobin and its genes". Cold Spring Harbor Perspectives in Medicine. 2 (12): a011627. doi:10.1101/cshperspect.a011627. ISSN 2157-1422. PMC 3543078 . PMID 23209182. ↑ A Syllabus of Human Hemoglobin Variants (1996). Globin.cse.psu.edu. Retrieved 2013-09-05. ↑ Hemoglobin Variants. Labtestsonline.org. Retrieved 2013-09-05. ↑ Uthman, MD, Ed. "Hemoglobinopathies and Thalassemias". Retrieved 2007-12-26. ↑ Reed, Leslie. "Adaptation found in mouse genes." Omaha World-Herald 11 Aug. 2009: EBSCO. Web. 30 Oct. 2009. ↑ "Mammoths had ′anti-freeze′ blood". BBC. 2010-05-02. Retrieved 2010-05-02. ↑ Projecto-Garcia, Joana; Natarajan, Chandrasekhar; Moriyama, Hideaki; Weber, Roy E.; Fago, Angela; Cheviron, Zachary A.; Dudley, Robert; McGuire, Jimmy A.; Witt, Christopher C. (2013-12-17). "Repeated elevational transitions in hemoglobin function during the evolution of Andean hummingbirds". Proceedings of the National Academy of Sciences. 110 (51): 20669–20674. doi:10.1073/pnas.1315456110. ISSN 0027-8424. PMC 3870697 . PMID 24297909. ↑ Beall, Cynthia M.; Song, Kijoung; Elston, Robert C.; Goldstein, Melvyn C. (2004-09-28). "Higher offspring survival among Tibetan women with high oxygen saturation genotypes residing at 4,000 m". Proceedings of the National Academy of Sciences of the United States of America. 101 (39): 14300–14304. doi:10.1073/pnas.0405949101. ISSN 0027-8424. PMC 521103 . PMID 15353580. ↑ "Hemoglobin Synthesis". April 14, 2002. Retrieved 2007-12-26. ↑ Burka, Edward (1969). "Characteristics of RNA degradation in the erythroid cell". The Journal of Clinical Investigation. 48 (7): 1266–1272. doi:10.1172/jci106092. PMC 322349 . PMID 5794250. Retrieved 8 October 2014. 1 2 van Kessel et al. (2003) "2.4 Proteins – Natural Polyamides." Chemistry 12. Toronto: Nelson, p. 122. ↑ "Hemoglobin Tutorial." University of Massachusetts Amherst. Web. 23 Oct. 2009. ↑ Steinberg, MH (2001). Disorders of Hemoglobin: Genetics, Pathophysiology, and Clinical Management. Cambridge University Press. p. 95. ISBN 0-521-63266-8. ↑ Hardison, RC (1996). "A brief history of hemoglobins: plant, animal, protist, and bacteria". Proc Natl Acad Sci USA. 93 (12): 5675–9. doi:10.1073/pnas.93.12.5675. PMC 39118 . PMID 8650150. ↑ "Hemoglobin." School of Chemistry – Bristol University – UK. Web. 12 Oct. 2009. ↑ Linberg R, Conover CD, Shum KL, Shorr RG (1998). "Hemoglobin based oxygen carriers: how much methemoglobin is too much?". Artif Cells Blood Substit Immobil Biotechnol. 26 (2): 133–48. doi:10.3109/10731199809119772. PMID 9564432. ↑ Hemoglobin. Worthington-biochem.com. Retrieved 2013-09-05. ↑ Van Beekvelt MC, Colier WN, Wevers RA, Van Engelen BG (2001). "Performance of near-infrared spectroscopy in measuring local O2 consumption and blood flow in skeletal muscle". J Appl Physiol. 90 (2): 511–519. PMID 11160049. 1 2 "Hemoglobin." MedicineNet. Web. 12 Oct. 2009. ↑ "Hemoglobin Home." Biology @ Davidson. Web. 12 Oct. 2009. ↑ "Hemoglobin saturation graph". altitude.org. ↑ King, Michael W. "The Medical Biochemistry Page – Hemoglobin". ↑ Ahrens; Kimberley, Basham (1993). Essentials of Oxygenation: Implication for Clinical Practice. Jones & Bartlett Learning. p. 194. ISBN 0867203323. 1 2 Goodman, Morris; Moore, G. William; Matsuda, Genji (1975-02-20). "Darwinian evolution in the genealogy of haemoglobin". Nature. 253 (5493): 603–608. doi:10.1038/253603a0. PMID 1089897. 1 2 3 Storz, Jay F.; Opazo, Juan C.; Hoffmann, Federico G. (2013-02-01). "Gene duplication, genome duplication, and the functional diversification of vertebrate globins". Molecular Phylogenetics and Evolution. 66 (2): 469–478. doi:10.1016/j.ympev.2012.07.013. ISSN 1095-9513. PMC 4306229 . PMID 22846683. ↑ Zimmer, E. A.; Martin, S. L.; Beverley, S. M.; Kan, Y. W.; Wilson, A. C. (1980-04-01). "Rapid duplication and loss of genes coding for the alpha chains of hemoglobin". Proceedings of the National Academy of Sciences of the United States of America. 77 (4): 2158–2162. doi:10.1073/pnas.77.4.2158. ISSN 0027-8424. PMC 348671 . PMID 6929543. ↑ Pin S, Alpert B, Michalowicz A (1982). "Oxygen bonding in human hemoglobin and its isolated subunits: A XANES study". FEBS Lett. 147 (1): 106–10. doi:10.1016/0014-5793(82)81021-1. PMID 7140986. ↑ Pin, S.; Valat, P.; Cortes, R.; Michalowicz, A.; Alpert, B. (1985). "Ligand binding processes in hemoglobin. Chemical reactivity of iron studied by XANES spectroscopy". Biophysical Journal. 48 (6): 997–1001. doi:10.1016/S0006-3495(85)83862-5. PMC 1329432 . PMID 4092074. ↑ Bianconi A, Congiu-Castellano A, Dell'Ariccia M, Giovannelli A, Burattini E, Durham PJ (1985). "Increase of the Fe effective charge in hemoproteins during oxygenation process". Biochemical and Biophysical Research Communications. 30 (1): 98–102. doi:10.1016/0006-291X(85)91775-9. PMID 4038310. ↑ Childs PE (2001). "Haemoglobin – a molecular lung: 2". Chemistry in Action (65). ISSN 0332-2637. ↑ Chen H, Ikeda-Saito M, Shaik S (2008). "Nature of the Fe-O2 bonding in oxy-myoglobin: effect of the protein". Journal of the American Chemical Society. 130 (44): 14778–14790. doi:10.1021/ja805434m. PMID 18847206. ↑ Chou KC (1989). "Low-frequency resonance and cooperativity of hemoglobin". Trends Biochem. Sci. 14 (6): 212–3. doi:10.1016/0968-0004(89)90026-1. PMID 2763333. ↑ Jensen, Frank B (2009). "The dual roles of red blood cells in tissue oxygen delivery: oxygen carriers and regulators of local blood flow". Journal of Experimental Biology. The Company of Biologists. 212 (Pt 21): 3387–3393. doi:10.1242/jeb.023697. PMID 19837879. ↑ Hall, John E. (2010). Guyton and Hall textbook of medical physiology (12th ed.). Philadelphia, Pa.: Saunders/Elsevier. p. 502. ISBN 978-1416045748. ↑ Nelson, D. L.; Cox, M. M. (2000). Lehninger Principles of Biochemistry, 3rd ed. New York, NY: Worth Publishers. p. 217, ISBN 1572599316. ↑ Guyton, Arthur C.; John E. Hall (2006). Textbook of Medical Physiology (11 ed.). Philadelphia: Elsevier Saunders. p. 511. ISBN 0-7216-0240-1. ↑ Biochemistry (Eighth ed.). New York, NY: W. H. Freeman. 2015-04-08. ISBN 9781464126109. ↑ Rutjes, H. A.; Nieveen, M. C.; Weber, R. E.; Witte, F.; Van den Thillart, G. E. E. J. M. (20 June 2007). "Multiple strategies of Lake Victoria cichlids to cope with lifelong hypoxia include hemoglobin switching". AJP: Regulatory, Integrative and Comparative Physiology. 293 (3): R1376–R1383. doi:10.1152/ajpregu.00536.2006. PMID 17626121. ↑ Gronenborn, Angela M.; Clore, G.Marius; Brunori, Maurizio; Giardina, Bruno; Falcioni, Giancarlo; Perutz, Max F. (1984). "Stereochemistry of ATP and GTP bound to fish haemoglobins". Journal of Molecular Biology. 178 (3): 731–742. doi:10.1016/0022-2836(84)90249-3. PMID 6492161. ↑ Weber, Roy E.; Frank B. Jensen (1988). "Functional adaptations in hemoglobins from ectothermic invertebrates". Annual Review of Physiology. 50: 161–179. doi:10.1146/annurev.ph.50.030188.001113. PMID 3288089. ↑ Rang, H.P. ; Dale M.M. ; Ritter J.M. ; Moore P.K. (2003). Pharmacology, Fifth Edition. Elsevier. ISBN 0-443-07202-7. ↑ "Hemoglobin Variants". Lab Tests Online. American Association for Clinical Chemistry. 2007-11-10. Retrieved 2008-10-12. ↑ Huisman THJ (1996). "A Syllabus of Human Hemoglobin Variants". Globin Gene Server. Pennsylvania State University. Retrieved 2008-10-12. ↑ Kikuchi, G.; Yoshida, T.; Noguchi, M. (2005). "Heme oxygenase and heme degradation". Biochemical and Biophysical Research Communications. 338 (1): 558–567. doi:10.1016/j.bbrc.2005.08.020. PMID 16115609. ↑ hypoxemia. Encyclopædia Britannica, stating hypoxemia (reduced oxygen tension in the blood). ↑ William, C. Wilson; Grande, Christopher M.; Hoyt, David B. (2007). "Pathophysiology of acute respiratory failure". Trauma, Volume II: Critical Care. Taylor & Francis. p. 430. ISBN 978-1-4200-1684-0. ↑ McGaffigan, P. A. (1996). "Hazards of hypoxemia: How to protect your patient from low oxygen levels". Nursing. 26 (5): 41–46; quiz 46. doi:10.1097/00152193-199626050-00013. PMID 8710285. ↑ "Definition of Glycosylated Hemoglobin." Medicine Net. Web. 12 Oct. 2009. ↑ Madsen, H; Ditzel, J (1984). "Blood-oxygen transport in first trimester of diabetic pregnancy". Acta Obstetricia et Gynecologica Scandinavica. 63 (4): 317–20. doi:10.3109/00016348409155523. PMID 6741458. ↑ Padmanaban, P.; Toora, B. (2011). "Hemoglobin: Emerging marker in stable coronary artery disease". Chronicles of Young Scientists. 2 (2): 109. doi:10.4103/2229-5186.82971. ↑ Society for Biomedical Diabetes Research. SI Unit Conversion Calculator. ↑ Hemoglobin Level Test. Ibdcrohns.about.com (2013-08-16). Retrieved 2013-09-05. ↑ Murray S.S. & McKinney E.S. (2006). Foundations of Maternal-Newborn Nursing. 4th ed., p. 919. Philadelphia: Saunders Elsevier. ISBN 1416001417. ↑ "Hematocrit (HCT) or Packed Cell Volume (PCV)". DoctorsLounge.com. Retrieved 2007-12-26. ↑ Frasca, D.; Dahyot-Fizelier, C.; Catherine, K.; Levrat, Q.; Debaene, B.; Mimoz, O. (2011). "Accuracy of a continuous noninvasive hemoglobin monitor in intensive care unit patients*". Critical Care Medicine. 39 (10): 2277–2282. doi:10.1097/CCM.0b013e3182227e2d. PMID 21666449. ↑ Ferrari, M.; Binzoni, T.; Quaresima, V. (1997). "Oxidative metabolism in muscle". Philosophical Transactions of the Royal Society B: Biological Sciences. 352 (1354): 677–683. doi:10.1098/rstb.1997.0049. PMC 1691965 . PMID 9232855. ↑ Madsen, P. L.; Secher, N. H. (1999). "Near-infrared oximetry of the brain". Progress in neurobiology. 58 (6): 541–560. doi:10.1016/S0301-0082(98)00093-8. PMID 10408656. ↑ McCully, K. K.; Hamaoka, T. (2000). "Near-infrared spectroscopy: What can it tell us about oxygen saturation in skeletal muscle?". Exercise and sport sciences reviews. 28 (3): 123–127. PMID 10916704. ↑ Perrey, S. P. (2008). "Non-invasive NIR spectroscopy of human brain function during exercise". Methods. 45 (4): 289–299. doi:10.1016/j.ymeth.2008.04.005. PMID 18539160. ↑ Rolfe, P. (2000). "Invivonear-Infraredspectroscopy". Annual Review of Biomedical Engineering. 2: 715–754. doi:10.1146/annurev.bioeng.2.1.715. PMID 11701529. ↑ This Hb A1c level is only useful in individuals who have red blood cells (RBCs) with normal survivals (i.e., normal half-life). In individuals with abnormal RBCs, whether due to abnormal hemoglobin molecules (such as Hemoglobin S in Sickle Cell Anemia) or RBC membrane defects – or other problems, the RBC half-life is frequently shortened. In these individuals, an alternative test called "fructosamine level" can be used. It measures the degree of glycation (glucose binding) to albumin, the most common blood protein, and reflects average blood glucose levels over the previous 18–21 days, which is the half-life of albumin molecules in the circulation. ↑ Mehagnoul-Schipper DJ, van der Kallen BF, Colier WN, van der Sluijs MC, van Erning LJ, Thijssen HO, Oeseburg B, Hoefnagels WH, Jansen RW (2002). "Simultaneous measurements of cerebral oxygenation changes during brain activation by near-infrared spectroscopy and functional magnetic resonance imaging in healthy young and elderly subjects". Hum Brain Mapp. 16 (1): 14–23. doi:10.1002/hbm.10026. PMID 11870923. ↑ "Cercacor - How Ember's non-invasive hemoglobin technology works". Cercacor - How Ember's non-invasive hemoglobin technology works. Retrieved 2016-11-03. ↑ L. Int Panis; B. Goddeeris; R Verheyen (1995). "The hemoglobin concentration of Chironomus cf.Plumosus L. (Diptera: Chironomidae) larvae from two lentic habitats". Netherlands Journal of Aquatic Ecology. 29 (1): 1–4. doi:10.1007/BF02061785. ↑ Zal F, Lallier FH, Green BN, Vinogradov SN, Toulmond A (1996). "The multi-hemoglobin system of the hydrothermal vent tube worm Riftia pachyptila. II. Complete polypeptide chain composition investigated by maximum entropy analysis of mass spectra". J. Biol. Chem. 271 (15): 8875–81. doi:10.1074/jbc.271.15.8875. PMID 8621529. ↑ Minic Z, Hervé G (2004). "Biochemical and enzymological aspects of the symbiosis between the deep-sea tubeworm Riftia pachyptila and its bacterial endosymbiont". Eur. J. Biochem. 271 (15): 3093–102. doi:10.1111/j.1432-1033.2004.04248.x. PMID 15265029. ↑ Liu L, Zeng M, Stamler JS (1999). "Hemoglobin induction in mouse macrophages". Proceedings of the National Academy of Sciences of the United States of America. 96 (12): 6643–7. doi:10.1073/pnas.96.12.6643. PMC 21968 . PMID 10359765. ↑ Newton DA, Rao KM, Dluhy RA, Baatz JE (2006). "Hemoglobin Is Expressed by Alveolar Epithelial Cells". Journal of Biological Chemistry. 281 (9): 5668–76. doi:10.1074/jbc.M509314200. PMID 16407281. ↑ Nishi, H.; Inagi, R.; Kato, H.; Tanemoto, M.; Kojima, I.; Son, D.; Fujita, T.; Nangaku, M. (2008). "Hemoglobin is Expressed by Mesangial Cells and Reduces Oxidant Stress". Journal of the American Society of Nephrology. 19 (8): 1500–1508. doi:10.1681/ASN.2007101085. PMC 2488266 . PMID 18448584. ↑ Boh, Larry (2001). Pharmacy Practice Manual: A Guide to the Clinical Experience. Lippincott Williams & Wilkins. ISBN 0-7817-2541-0. ↑ Holden, Constance (2005). "Blood and Steel". Science. 309 (5744): 2160. doi:10.1126/science.309.5744.2160d. ↑ Moran L, Horton RA, Scrimgeour G, Perry M (2011). Principles of Biochemistry. Boston, MA: Pearson. p. 127. ISBN 0-321-70733-8. ↑ Henry, Sean (August 7, 2014). "Take a sneak peek at the MUHC's art collection". CBC News. Retrieved February 1, 2016. ↑ "Lustre (Hémoglobine) 2014". Art Public Montréal. Montréal. Retrieved February 1, 2016. Campbell, MK (1999). "Biochemistry" (third ed.). Harcourt. ISBN 0-03-024426-9. Eshaghian, S; Horwich, TB; Fonarow, GC (2006). "An unexpected inverse relationship between HbA1c levels and mortality in patients with diabetes and advanced systolic heart failure". Am Heart J. 151 (1): 91.e1–91.e6. doi:10.1016/j.ahj.2005.10.008. PMID 16368297. Ganong, WF (2003). "Review of Medical Physiology" (21st ed.). Lange. ISBN 0-07-140236-5. Hager, T (1995). "Force of Nature: The Life of Linus Pauling". Simon and Schuster. ISBN 0-684-80909-5. Kneipp J, Balakrishnan G, Chen R, Shen TJ, Sahu SC, Ho NT, Giovannelli JL, Simplaceanu V, Ho C, Spiro T (2005). "Dynamics of allostery in hemoglobin: roles of the penultimate tyrosine H bonds". J Mol Biol. 356 (2): 335–53. doi:10.1016/j.jmb.2005.11.006. PMID 16368110. Wikimedia Commons has media related to Hemoglobin.